On popular demand a wheat free cracker for cheese, suitable for coeliacs. 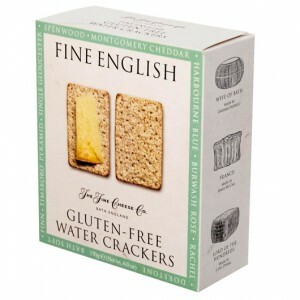 New in from The Fine Cheese Company – Gluten free Water Crackers for cheese. To answer the demand for gluten-free we are introducing a new Water Cracker that is surprising delicious as well as suitable for coeliacs. It has a toasty flavour and is thin and crunchy and a great addition to the range. Ingredients: maize flour, soya bran and tapioca, it is wheat free, gluten free and dairy free.